Award Year: 2005 So much medical information delivered in the mass media - from public health campaigns to drug commercials - concludes by advising the audience to "talk to your doctor." Sounds simple enough, but in fact, research is beginning to suggest that doctor-patient communications can be highly variable, particularly when doctors and patients come from different socio-economic backgrounds. M. Robin DiMatteo, Ph.D. is especially interested in the communication breakdown that occurs when patients are from a disadvantaged background. Her project, Ethnicity, Social Class, and the Primary Care Medical Visit: The Process of Provider-Patient Communication, considers the extent of communication disparities and how they might affect health care outcomes. Dr. DiMatteo also examines whether training programs for physicians and patients can help close the communication gap and enhance physician-patient partnerships. Her project should produce new insights into the use of effective communication as a means of reducing disparities in the delivery of primary care. 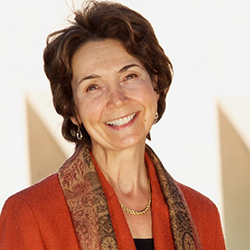 Robin DiMatteo is Distinguished Professor of Psychology at the University of California at Riverside. She received her Ph.D. in 1976 from the psychology and social relations program at Harvard, and has spent her entire career at UC Riverside. She has served as chair of the psychology department, and is a recipient of UCR's Distinguished Teaching Award. Since she was a graduate student under the mentorship of social psychologist Robert Rosenthal, Dr. DiMatteo has studied the micro-social environment of health care delivery. Her work on dyadic interactions in health care has focused primarily on physicians and patients, but recently she has broadened her studies to include nurses. She is interested in interpersonal behavior in the process of care, including both providers' and patients' verbal and nonverbal communications. Dr. DiMatteo also studies patient adherence to medical treatment. For the past two decades, she has examined the measurement and prediction of patient adherence, focusing on patient knowledge, beliefs, attitudes, behavioral constraints, depression, social support, illness severity, and provider-patient communication as they affect patients' willingness and ability to follow a variety of preventive and treatment recommendations. Her current work involves the study of income and ethnic disparities in provider-patient communication and in the promotion and maintenance of patient adherence to treatment. DiMatteo, M.R., Haskard, K.B. Promoting Treatment Adherence, InÊHandbook of Communication in Oncology and Palliative Care, eds. Kissane, D., Bultz, B., Butow, P., Finlay, I. Oxford University Press, 303-13, 2010. DiMatteo, M.R., Haskard, K.B., Williams, S.L. Adherence and Health Outcomes: How Much Does Adherence Matter? In The Handbook of Health Behavior Change 3rd edition, eds. Shumaker, S.A., Ockene, J.K., Riekert, K. New York: Springer, 771-84, 2008. DiMatteo, M.R., Haskard, K.B., Williams, S.L. Psychosocial Barriers to Adherence and Lifestyle Change, In The Handbook of Health Behavior Change 3rd edition, eds. Ockene, J.K., Shumaker, S.A., Riekert, K. New York: Springer, 445-62, 2008. Haskard, K.B., DiMatteo, M.R., Heritage, J. Affective and Instrumental Communication in Primary Care Interactions: Predicting the Satisfaction of Nurses and Patients. Health Communication, Jan 2009, 24(1): 21-32. Haskard Zolnierek, K.B., DiMatteo, M.R., Mondala, M.M., Zhang, Z., Martin, L.R., Messiha, A.H. Development and Validation of the Physician-Patient Humor Rating Scale. Journal of Health Psychology, 2009 Nov, 14(8):1163-73. DiMatteo, M.R., Murray, C.B., Williams, S.L. Gender Disparities in Physician-Patient Communication among African American Patients in Primary Care. Journal of Black Psychology, May 2009, 35(2): 204-27. Haskard Zolnierek, K.B., DiMatteo, M.R. Physician Communication and Patient Adherence to Treatment: A Meta-Analysis. Medical Care, 2009, 47: 8. Haskard, K.B., Williams, S.L., DiMatteo, M.R., Rosenthal, R., White, M.K., Goldstein, M.G. Physician and Patient Communication Training in Primary Care: Effects on Participation and Satisfaction. Health Psychology, Sep 2008, 27(5): 513-22. Haskard, K.B., Williams, S.L., DiMatteo, M.R., Heritage, J., Rosenthal, R. The Provider's Voice: Patient Satisfaction and the Content-Filtered Speech of Nurses and Physicians in Primary Medical Care. J of Nonverbal Behavior, 2008, 32(1): 1-20. DiMatteo, R., Haskard, K.B., Williams, S.L. Health Beliefs, Disease Severity, and Patient Adherence: A Meta-Analysis. Medical Care, 2007, 45(6): 521-8. Williams, S.L., Haskard, K.B., DiMatteo, M.R. The Therapeutic Effects of the Physician-Older Patient Relationship: Effective Communication with Vulnerable Older Patients. Clinical Interventions in Aging, 2007, 2(3): 453-67. Martin, L.R., Haskard-Zolnierek, K.B., DiMatteo, M.R. Health Behavior Change and Treatment Adherence. New York: Oxford University Press, 2010.